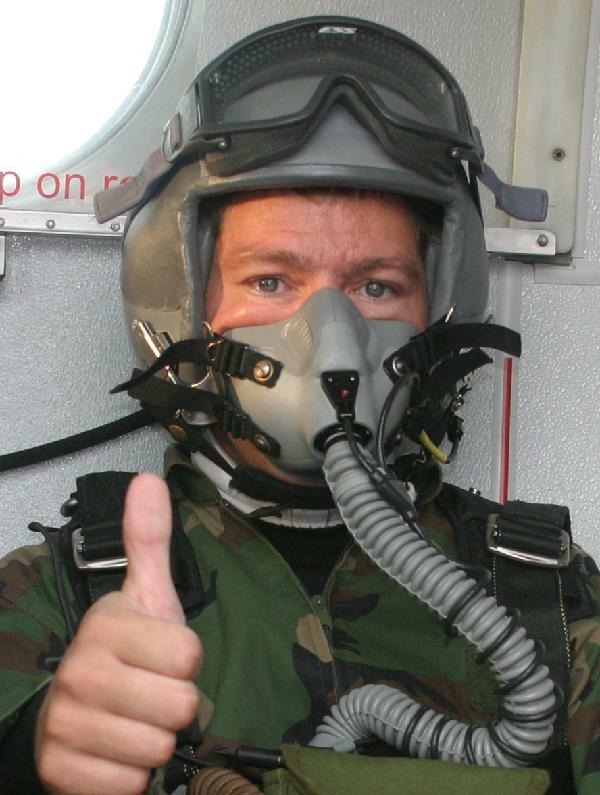 Only a few people have ever attempted a tandem HALO jump, and I was number 25 in the world. At the moment it is only Kevin and Ben from halojumper.com in the US that do civilian HALO tandem jumps, thus if you want the thrill of jumping from 30000 feet you have to go to the US. But it gets a little more complicated, the max allowed altitude was 28500 feet, however during the World Free fall Convention in July 2006 there was no limit from FAA and this gives the possibility to jump from 30000 feet or higher. The day before the jump all the gear was fitted and I was taught how to use the equipment and the routines of switching from the 100 % pure oxygen in the plane to the mixed oxygen bottle attached to my stomach. The training is quite thorough and Kevin and Ben, while stressing the importance of the routines and awareness, make no jokes about the danger of doing this jump. It is dangerous, but I would love to do it again with Kevin and Ben, they certainly have the experience needed to make this jump safe ! The actual jump was very early in the morning, and nobody else can jump at the World Free fall Convention until we have been up and down. 4:30 is very early, but before we were fitted, and the weather had improved enough to attempt the jump an hour had been spent. There is very little pressure at 31000 feet, so we had to prebreath 100 % pure oxygen until our body is saturated with oxygen, this is to avoid getting the bends. The temperature is -40 degrees outside, without counting the windchill factor. With all our gear we are getting in the plane and hooked up to the onboard Oxygen system .... we sit there prebreathing Oxygen for about 25 min. before take-off and then we continue breathing 100 % pure oxygen until 28000 feet when we prepare to jump, at this point we switch oxygen from the plane to our "normal" oxygen in the attached bottle. We are looking for a clear hole in the clouds, and this we find at 30700 feet and then we get ready to jump out of the plane. When we jump out of the plane, the camera man to film the jump is hanging outside the door as we stand in the door with our feet halfway out ........ and then we jump. I really feel the force and it feels like the mask and helmet is being ripped off my face/head. The freefall lasts for more than 2 min. and I have a clear memory of the fall, especially when we fell through a cloud, because it lasts for a long time and when we get through I feel that the air isuddenly much warmer and we open the parachute. The free fall lasts from 31000 feet to 5000 feet when we open the parachute.